Important: Please note that due to a chart upgrade in January 2016 some of the following functionality is likely to have changed. Charts can play a fundamental part in forming a trading strategy and the charts on Financial Spreads are designed to make formulating your strategies quicker and easier. A range of time intervals e.g. by the tick, 1, 2, 3, 5, 10, 15, 30 minute chart intervals as well as 1, 2 and 4 hour intervals. In addition, there are 1 day, 1 week and 1 month intervals. Popular overlays e.g. Bollinger Bands, Exponential Moving Average (EMA), Ichimoku Kinko Hyo Clouds, Moving Average, Parabolic SAR and Wilder's Smoothing. Secondary charts e.g. MACD, Momentum, Relative Strength Index (RSI), Stochastics, Williams %R, % Price Oscillator, Aroon, Commodity Channel Index (CCI), Swing Index, TRIX and Ultimate Oscillator. 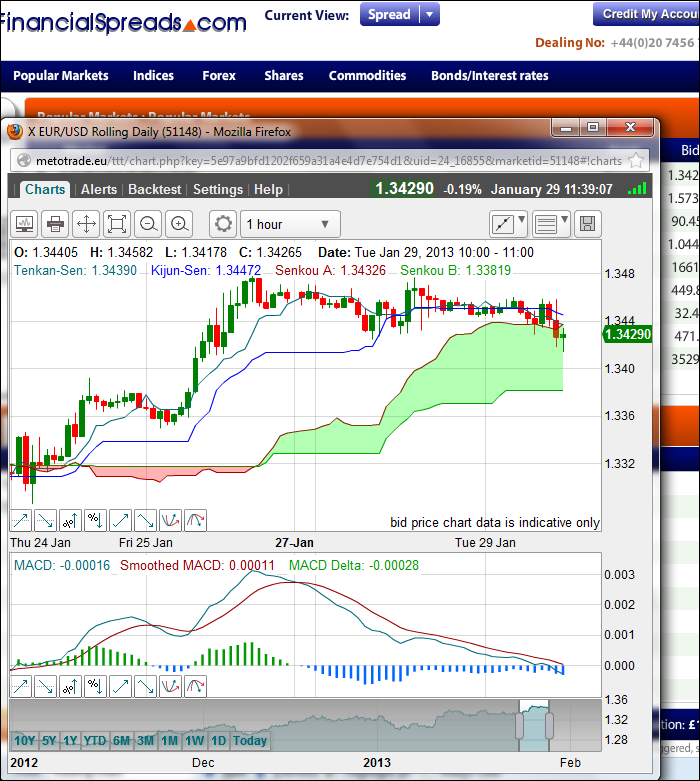 Using the point and click interface, it is possible to combine technical indicators e.g. to create an indicator that is the Moving Average of the Upper Bollinger Band. Custom indicators can be created with features such as add, multiply or 'get the highest high price over a period of time' and can then be applied to price data or other technical indicators. Investors can be instantly alerted so that they don't miss a potential trading opportunity. Alerts can be set up from the charts so that the investor will be emailed or alerted via MSN whenever a pre-specified condition is met. E.g. if a price breaks through a trend line the investor has drawn or if a technical analysis crossover occurs. The alerts are quick and easy to set up. Investors can set their own alert rules. The alerting functionality supports various trigger types and all alert triggers can be applied to any indicator or price. Trendline alerts can be added to the technical indicators on the secondary charts. Alerts can be set for the 'closing price of the interval' or for 'each tick of the interval'. Alerts can be grouped in varying sequences and displayed on the chart. Investors can use the backtesting functionality to see how certain price movements, or other historical technical analysis conditions, have performed. The backtesting features show whether a particular strategy has been successful or unsuccessful in the past. Backtesting provides a quick summary of the performance with a tearaway chart for detailed analysis of the strategy. To help visualise the optimum stop and limit values, all backtest trade events are analysed graphically, displaying highest highs and lowest lows while the trade was open. To help refine entry and exit trading strategies, each backtest alert or trade event is displayed on an interactive chart. Backtests can be shared with friends. 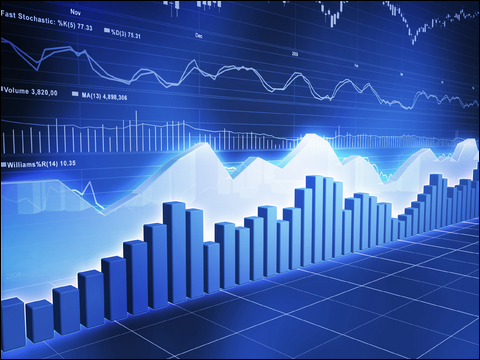 Technical Analysis can be a fast and convenient form of analysis. However, it is important to remember that technical analysis is predicated on historic data. Just because a particular stock market index has been forming a particular pattern that does not mean the index will continue to form that pattern in the future. Put another way, any information relating to the past performance of a market does not guarantee the future performance of that market. Please note that the charts can be viewed in Firefox and Internet Explorer but they are best viewed in Google Chrome.